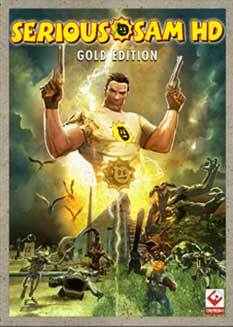 ​The King of Indie Games has reclaimed his crown with Serious Sam HD: Gold Edition! The King of Indie Games has reclaimed his crown with Serious Sam HD: Gold Edition. The definitive collection of Serious Sam’s trademark arcade-style shooter gameplay is packed to the brim with non-stop action and includes revamped high-definition versions of Serious Sam HD: First and Second Encounters as well as classic versions of both games! Developed by Croteam and powered by the Serious Engine 3, Serious Sam HD combines spectacularly enhanced visuals, including more polygons, higher resolution textures and more special effects for the gold standard in arcade-style FPS gaming. Serious Sam HD: First and Second Encounter feature epic campaign co-op modes and over a dozen high-octane multiplayer modes like deathmatch, capture the flag and the new survival matches for up to 16 players. Serious Sam HD: Gold Edition also includes the original Serious Sam: First and Second Encounter titles from 2001/2002 with four-player split screen, LAN support and the Serious Editor for custom maps creation!